Entrepreneurs . . . we are strange folk, strange in the sense that we gladly wear many hats. Of course, this is what we must do in order to make a new company successful. Yet far too often, some business leaders spread themselves too thin as they attempt to do too much, too soon. 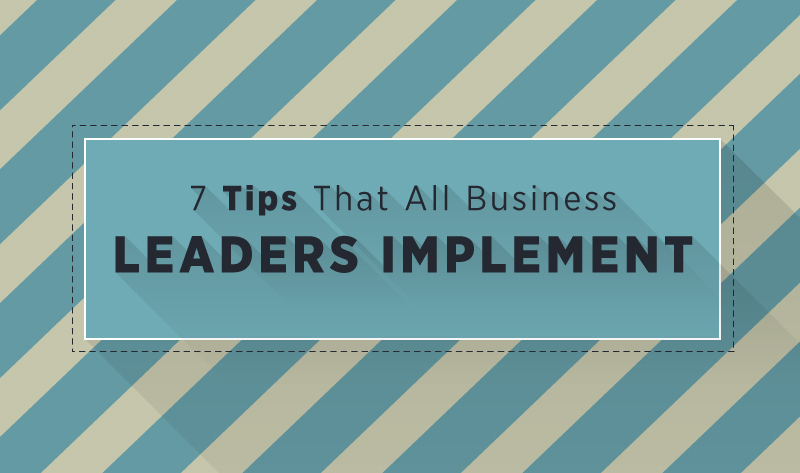 To help with the processes of being both a successful and sane entrepreneur, here are seven tips that all high-level business leaders implement in their lives. What makes a company great is the person at the helm: the entrepreneur. A great entrepreneur is often able to turn any product into a success company. Entrepreneurs are not afraid to take a leap into the unknown and start something that has never been created before. These visionaries are remarkably brave and don't look to market research or evidence to tell them what is possible. As innovators, they often follow their instincts. Entrepreneurs look forward and consider the long-term when making decisions. This vision of the future is crucial for growing a successful business. One of the best ways to become a successful entrepreneur is to do what you love. If you truly enjoy what you are doing, it will not seem like work. Finding a niche, hobby, or industry you are passionate about will certainly make you more focused as you start and run a business around that interest. The goal is to come up with products or services that you would enjoy using, and, ultimately, other people will enjoy using them as well. Once you turn your ideas into viable products or services, you can then build a company around them. The ideas and concepts you have can often lead to marketable products and companies. Entrepreneurs and their creative teams often have many great ideas. The challenge is choosing the idea that will yield the greatest profits, while saying no to other equally great ideas. With limited resources and funding, a company needs to focus on that one outstanding idea that truly solves a problem. This means analyzing an idea and determining how fast you can produce it, how much it will cost, and how soon you can get it on the market. These are the most important questions to ask about any idea. A simpler product is often better than a more complex one because you can launch the latter faster and spend less money in development. You want your company to become profitable as soon as possible. A business plan is essential for any startup, especially if you want funding. A business plan is an outline of how you will run your company. It solidifies your ideas and strategies, and shows others that you have carefully thought about the business. With a plan you have a document that provides clear direction for your company. You can refer to this roadmap on a regular basis to keep your company focused. A business plan helps you to know what to do next, and allows you to monitor your progress over the years. You should always be realistic and conservative in your plan and acknowledge any challenges you may face in starting a business. A great team is essential for creating a great company. Your employees are an asset and an investment in your future. It is important to take the time to hire the right person for every position to ensure that all staff members perform their jobs well. Staffing is a risk, so you want a company environment that encourages and motivates your best people to improve and innovative. For example, over 74% of executives believe innovation is more important for long-term success than cost reduction. You also want reliable team members which can adept quickly to changes in the company or the industry. Also keep in contact with people you did not hire, but really liked in case an employee suddenly quits and you need a replacement quickly. In any company, good communication is crucial. In fact, a recent study found that 50% of employees consider communication between employees and senior management as a key figure. You need to communicate your vision to employees and investors so you all know you are working towards the same goal. Management needs to keep employees apprised of what is going on in the company. Transparency is important for your staff as well as for customers. There should be an open door policy that allows employees to feel safe when discussing any business-related issues that are troubling them. Management also needs to be clear about what employees have to do as part of their jobs and why. In the best companies, the employees feel that management listens to their ideas and their concerns. Entrepreneurs need to expand their skill sets. Being a lifelong student and learning new things will help your company in numerous ways. You should continue to grow as a person and as an entrepreneur. Although no one can learn everything about business, you can increase your expertise in a few more areas. At the same time, you cannot over think every decision. By having more skills and a broader outlook, you are better able to take advantage of new opportunities when they present themselves. Entrepreneurship is not for everyone. However, for those with the itch to start their own companies, these seven tips can greatly improve your odds of growing a successful startup.